China’s Social Credit System – What is it and how different is it from the U.S. system? Revisions to China’s Criminal Procedure Law – Will Defendants Have Rights? Cybercrime, China & the U.S. When Nien Cheng passed away on November 2, 2009, I did not know who she was. Chinese studies listserves were abuzz about her passing, but as someone who started in the Chinese studies field in the late 1990s, I was unfamiliar with her work. 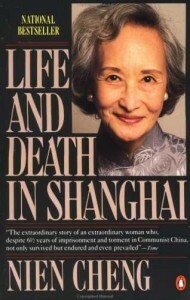 A quick Wikepedia search revealed that in 1987, she wrote a book about her time in Shanghai during the Cultural Revolution (1966-1976) – Life & Death in Shanghai – but her book didn’t seem any different than the many other memoirs I had read about the Cultural Revolution. Fast forward a year and a half and I found myself in a soon-to-be-closed Borders Bookstore in lower Manhattan staring at a pile of Nien Cheng’s Life and Death in Shanghai on the “Ultra Bargain Books” table and stamped with a $1.99 price tag. Even at two bucks, I hesitated in purchasing the book, but Ms. Cheng’s picture on the cover – a grandmotherly woman, with big pearl earrings and make-up perfectly in place – refined, older and beautiful Chinese woman wistfully gazing out – caught my attention. And thankfully it did because Ms. Cheng’s memoir is decidedly different from the others I had read. It is a must read for anyone who wants to truly understand both on an intellectual and emotional level, the personal and physical costs of China’s Great Proletarian Cultural Revolution. Ms. Cheng’s story starts on the eve of the Cultural Revolution, a hot, steamy morning in her lavish Shanghai home. Although the Chinese Communists had been in power for more than 15 years, three servants continue to wait on Ms. Cheng and her daughter. But as the Cultural Revolution begins to heat up, her lifestyle, her life abroad, and her former employer in Shanghai – Shell Oil Company which only shut down its office in China in 1965 – make her the perfect target for Mao Zedong’s new campaign against the remaining vestiges of “capitalist privilege” in China. On that fateful morning, Ms. Cheng is dragged away by low-level Chinese officials, all the while lamenting about their ill treatment and their improper manners. Communist officials – continue for months during the summer of 1966 as the struggle sessions against her former Shell colleagues, and eventually her, increase in intensity. At first, it’s hard to have much pity for Ms. Cheng – her grievances seem trivial, and – for lack of a better word – bourgeois. Seventeen years into the Communist Party’s reign, how could Ms. Cheng expect to maintain such a lifestyle and it comes to a shock that she did. But that is what makes Ms. Cheng’s memoir interesting and an essential read. Most memoirs of the Cultural Revolution (at least in English) are written by former Red Guards – individuals who would have been in high school or college during the time. Ms. Cheng was much older, much more experienced in life, and much more politically aware when the Cultural Revolution began. Because of her age and experiences, Ms. Chung’s memoir does one of the best jobs in placing the Cultural Revolution in its historical context, questioning many people’s simple perception that the Chinese Party’s rule from 1949 until 1976 was a simple lineal progression to communism. 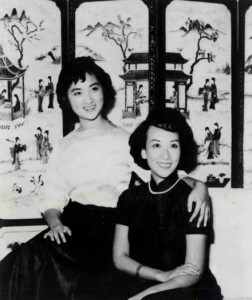 In fact, Ms. Cheng’s story shows that there were differing voices in the CCP leadership that at times held sway – Shell was allowed, even encouraged, to maintain a presence in China because by the early 1960s, certain market reformers had significant power in the Chinese leadership; at one point Ms. Cheng’s life was saved because she defended Liu Shaoqi – a senior leader who fell out of Mao Zedong’s favor but was still supported by certain Red Guard factions. But more than the historical context is the strength that Ms. Cheng shows in her six years of solitary confinement, suffering the abuse, torture, and near death experience at the hands of the Red Guards. 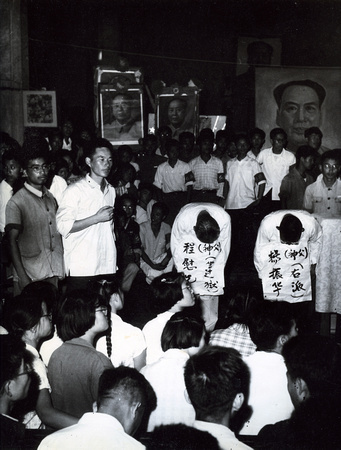 Many a Cultural Revolution memoir is more of a mea culpa for the author’s betrayals – turning on a father or a close friend in order to preserve his or her own life. But Ms. Cheng has no reason to offer such an apology for she never succumbs to what must have been intense pressures on the intellectual class. Before being taken away to prison, Ms. Cheng is visited by a close friend of her dead husband who gives her one piece of advice – do not make a false confession, no matter how heavy the pressure. These are words she ends up living by and which not only eventually save her, but save many others who the Red Guards attempted to implicate during Ms. Cheng’s various “interrogations.” As Ms. Cheng points out in her book – although rule of law was largely non-existent during the Cultural Revolution, the procedures of a legal system were still in place – there was a deep need for her interrogators to obtain “evidence” in order to “convict” her and others of political missteps. Ms. Cheng is finally freed in 1973 but it is questionable if her life improves. [ATTENTION PLOT SPOLIER] Upon her release, Ms. Cheng finds out that her daughter – her only child – has died. The revelation takes the reader by surprise as one has been so focused on Ms. Cheng’s survival that one has forgotten about her life outside of prison. Interestingly, Ms. Cheng’s memoir does not dwell on her daughter’s death nor does it describe the deep and visceral pain Ms. Cheng must have suffered in eventually learning that her daughter was killed by an overzealous Red Guard that attempted to pressure her to turn on her mother. It is the murder of her daughter, and what is eventually the denial of justice for her daughter, that makes Ms. Cheng’s survival all the more tragic. There will be no Hollywood ending for Ms. Cheng, where she is happily reunited with her daughter; instead, Ms. Cheng must live the remainder of her life with this hole in her heart, and while Ms. Cheng never precisely states it, the reader is left wondering why; why this gentle, strong woman had to lose her beautiful child; why any of this had to happen at all; and how could these experiences not still resonate in most Chinese people’s minds. 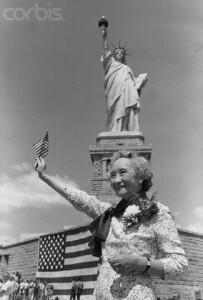 In 1983, Ms. Cheng left China for Canada and finally the United States. But before leaving, Ms. Cheng donated her antique Chinese porcelain to the Shanghai museum. When the Red Guards first ransacked her home in 1966, Ms. Cheng pleaded with the immature high school students to save her valuable pieces of porcelain, pieces that today fetch millions in auctions throughout the world by Chinese buyers attempting to reclaim their history. But while Ms. Cheng still respects the beauty of these pieces, she no longer seems to care. Party insists on white-washing its history and denying its people the choice of what to remember and who to celebrate. The newly renovated National Museum of History in Beijing barely mentions the Cultural Revolution, providing only one picture from that time period and three lines of text, reflecting a government intent on suppressing its own history. Life and Death in Shanghai is one of the best Cultural Revolution memoirs I have read and is a must read for anyone who wants to understand China. It is also a must read for the Chinese people as well, for them to know that during one of the darkest periods of their history, there were individuals who never lost sight of their moral convictions and who in their individual ways helped to guide their country through such a tumultuous period; even in the darkest days, there is still a history that the Chinese people can be proud of. Hopefully one day, the Chinese people will be able to celebrate these people, like the rest of the world already has. Life and Death in Shanghai , by Nien Chang (Penguin Books, 1987), 543 pages. The Digital Silk Road at the China Institute –Too Much Pollyanna?